As time goes by and craft beer continues its seemingly inexorable rise, the education of both drinkers and retailers becomes an ever more important part of the process. Knowledge around how beer should be treated after it leaves the brewery so it reaches drinkers' glasses in the best possible condition is something the beer industry – brewers, retailers, passionate consumers, media – has been addressing in many and varied ways, particularly when it comes to highly hopped beers. 3 - 6 MONTHS: END OF PRIME TIME, DRINK ME NOW FOR F*** SAKE! until reaching 12 months and "GAME OVER. MAY AS WELL NOT EVEN CALL ME AN IPA ANYMORE." With the canned on date stamped clearly on the base, it's as good a way of putting the emphasis on getting it into your belly soon. 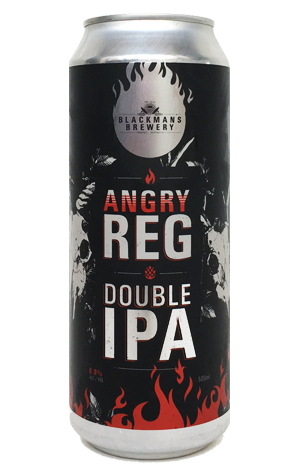 When you do, you'll find a take on the brewery's flagship Reg IPA with everything – hops, malt, colour, bitterness and booze – ratcheted up to 11 (well, not literally in terms of booze). As Crafty Pot Jr might say (if he was 16 years older and allowed to drink): "It's a whopper!"